It’s time I invested in a separate table for my jigsaw puzzle pieces. 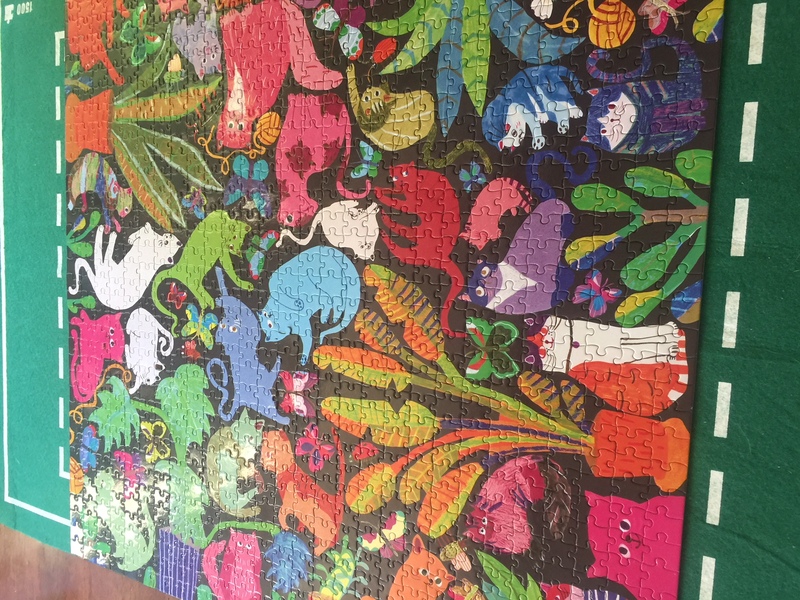 The other day, one of my grandsons knocked over his water glass at dinner and water cascaded the length of the table down to my incomplete jigsaw puzzle where it enveloped several pieces. This is an excellent puzzle with thick cardboard pieces, a few of which have now come unstuck from their base, like a wedge heel coming off a platform shoe. The pieces are intact but split down the middle. My husband reckons we can glue them back together once dry but somehow their unstuckness represents so much more than a few unstuck jigsaw puzzle pieces. The dog just joined me at my desk and is now there at my feet eager for company in the way of dogs. It amazes me how little he needs by way of comfort, just the simple proximity of a human will do. Whereas we humans seem to need and want so much more, so much more that life can become a grind of satisfying our own and one another’s expectations. I feel this strongly during holidays when my own expectations of getting a rest don’t necessarily match the events that life throws up and I’d prefer not to have the added burden of expecting to a rest on top of the usual stresses. The other day, I heard Robert Dessaix on the radio talking to David Mann about Dessaix’s book The Pleasure of Leisure and the whole time I listened I found myself annoyed. There was something cosy about the two men chattering to one another with their various definitions of laziness and indolence versus idleness. And they were talking from an historical perspective as well. I only caught the opening of the talk, which was just as well. By the time, I pulled into the driveway of our house I had had enough of what I heard as the privilege of two older white guys going on about the need to take things easy. These days I hear everything from this perspective. Who is the privileged one – including myself at times – and who gets to do the work? I’ve got it in for male writers at the moment, with apologies to any of my male readers here. Yesterday, I went to the en suite bathroom and noticed my husband’s book, one of several he has on the go. Chris Masters’ book, No Front Line. Could this be the same Chris Masters, journalist, whose mother, Olga Masters, I first heard about and read when I began on my writing journey forty years ago? She who had something like six children and who did not start her own writing career until later in life when her children were more or less grown and then she became a brief sensation in the literary world before dying young, or at least young in relative terms. It saddened me then and it saddens me now. 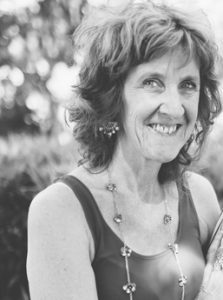 Her life cut short, her life split in half, between her obligations as a parent and her life as a writer. How would it have been had it occurred to her she could have started earlier? And she might well have started writing earlier but it took till mid to later age before she could venture into seeking publication. And it all takes so long. So there is Chris Masters’ book on the en suite vanity and I dip into it and read about war. I recoil at the language and at the pictures. Not a woman in sight except perhaps some poor peasant woman from Afghanistan caught up in the fighting and I despise war and the stuff that brings it about. This violent approach to life polarises us and I know full well women can get into it too but women are not the drivers of war. I helped my younger grandson make a gun yesterday out of an offcut of wood and a Texta, one of those Textas with a cap out of which a section protrudes onto which you can attach the caps of other like Textas so that they join in a row. He used this section on the cap as his trigger and needed my help to fit the Texta and wood tight together with sticky tape so that he had his gun ready for firing then walked around the house shooting at imaginary targets. I know these ways of operating are learned, constructed not hard wired and that he picked up such ideas from his online experience and from his older brother and peers, and it’s not a tragedy, it is what it is. No matter we don’t run around with guns in Australia, my grandson is still drawn to them for all the complex reasons available to our understanding. But it too feels spilt to me, between the need to develop some understanding of the dangers of guns and not idealise them as little boys do and the need to tolerate his aggressive impulses and learn to tame them as we girls are taught from earliest days to tame ours. I was annoyed with my grandson when he spilled the water not that I carried on too much about it. 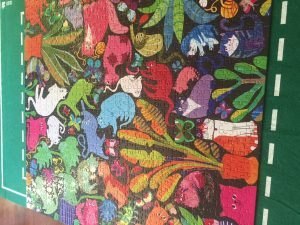 It was, after all, an accident, but it still rankles to see my jig saw pieces damaged just as I was beginning to get into this new bright and cheerful experience. Of putting together another world. A cacophony of cats. My jig saw on completion with the split pieces no longer visible. I’m trying to remember the last jigsaw I completed, the last jigsaw I bought for myself. It’s been a long time, a very long time. I have a vague recollection of buying one during the first year of my first marriage, a science fiction scene. After that I honestly cannot picture myself doing a jigsaw again until I ordered one as a present for my daughter. We took a nice photo of her taken in moonlight standing on the end of a jetty and had it turned into a jigsaw. Obviously when it arrived I wanted to make sure all the pieces were there. And that’s it. There were jigsaws in my childhood including a circular one which I glued to a board and hung on my wall. I remember being very pleased about that one but I couldn’t tell you what it was of. I do remember the one my dad and I did together of the Forth Road Bridge (https://goo.gl/6LPvhG). What I remember most about it was he finished it one night when I was in bed apart from one piece; he left the last piece for me. It’s things like that my siblings forget when they talk about Dad. It’s too easy to dismiss stuff like that. I’ve always struggled with the concept of leisure. I haven’t had a paid job for years but I don’t consider my life a life of leisure. I don’t even walk at a leisurely pace. I’ve never understood people who could spend their days lolling on beaches. If you need to lie down go to bed and do it properly. I’m not a lazy person. Never have been. Granted I’m less efficient now and that frustrates me no end but you cut your cloth. I recall a teacher called me indolent once. I didn’t know the word at the time and had to look it and I can tell you I was royally offended when I learned what it meant. At the age I was then—about fourteen I’d guess—I never stopped. I always had several projects on the go. I longed to get old so I could get by off three hours sleep a night and I’m still waiting on that. When I was very young I had a plastic rifle but then my parents decided guns weren’t appropriate toys although I used to construct ray guns with Lego and I do remember acquiring a spud gun somewhere along the line. Nowadays I don’t have much interest in firearms. Some weapons are attractive from a design point of view—I feel the same about tanks—but that’s about it. In my teens one of my mates got his hands on an air pistol and we entertained ourselves for an afternoon down the beach shooting at tin cans but that was about it. I’ve never held an actual gun and I do think honestly they frighten me more than they fascinate me. I’m certainly grateful we don’t live in America. Yes indeed, Jim, from where I sit to live in America would be terrifying, with all those guns, and that president. I watched a TV series a few weeks ago called Godless about the days of the wild west. A fictional account of a town named LaBelle and a man named Griffin who intended to rout the town in retribution for harbouring a once loved unofficially adopted son who had abandoned Griffin’s posse of 30 murderous lunatics. I found it hard going, the level of violence and the use of guns as a solution to every incident. Someone recently told me you wouldn’t get road rage as much in America as you do in Australia because in America if you lose your cool on the roads you’re likely to get shoot, whereas here you’re most likely to cop a punch or plenty of verbal abuse. This response is at a tangent from jigsaws but the violence part follows. And those awful things called guns. I’m pleased to say i’ve never handled one either, though my husband once had a rifle for shooting rabbits and although I looked at it I never once touched it. Killing machines that they are, those guns. Thanks Jim. Oh my god, this post. Your inimitable tone and choice of words, how it meanders and whips us. The anger. I love it. Thanks, Elizabeth. There’s nothing like a rant to shore up the anger. It’s needed at times. I have a lot to say about this post, Elisabeth but I will try to be brief. I have raised 3 boys and all of them at one time or another played with or made guns but none of them have grown into men who use or glorify guns. Another mother once said to me, ‘Our son always wishes for a gun and we tell him ‘No’, but our daughter, who always asks for a doll, always finds one among her gifts.’ Double standards? As for women and their careers, do we not choose to do as we please first, regardless of any regret later? I don’t know any woman who was forced to love a man, bear him children and not be ‘allowed’ to follow an interest. Many of my friends are now at the top of illustrious careers as scientists, lawyers and other professions whose degrees were gained among the dishes and meal scraps on the kitchen table. Many of their husbands careers have come to abrupt halts from changes in workplace policies or health issues and have had to retire and take charge of the domestics. I have never heard any of them say they would ever change things. Not that all women feel the same, but I do get tired of hearing about the oppressed first world woman. These days I see myself as part of the ‘privileged majority’. I can pretty much do whatever I please without fear of oppression, prejudice or control and the few problems I have are nothing in comparison to those without my freedoms. Do I regret choices I made in my younger years? Only with hindsight and the wisdom of years but watching those younger navigate their decisions I know the adage ‘you can’t put old heads on young shoulders’ is so true. I take your point, Karen. I’m not so much troubled by boys and their childhood pleasures in guns but I’m aware our attraction to these things as gendered as they might seem are also societally constructed. As for the women in your life who are not oppressed – and I include myself here – there are many whom we don’t know, but I know about them through studies I’ve read and the experience I’ve had in the field and with my daughter who also works with domestic violence. There are many women in first world countries who are oppressed and the fact that a woman at least is killed once every week by a male partner, and that’s an underestimation from accurate stats, says there is a problem, though not for us it seems. And certainly things are better than they were as little as fifty years ago when women had to quit their jobs as soon as they married etc. Mind you the gender pay gap continues to exist. Thanks Karen.